scientist after finishing a post-doc at UCSF in cancer symptom management. I knew very little about quality management and was curious why a PhD nurse was the quality manager at a community hospital. Fortunately I knew something about fatigue research, and was interested to talk with Dr. Luna about hospital nurse fatigue. During the next few years, Dr. Luna and I read and discussed many reviews, studies, and dissertations to help clarify the complex relationships and sometimes confusing definitions of nurse fatigue and patient safety. Our initial ideas resonated with a nurse fatigue dissertation we read by Dr, Linsey Barker Steege, a human engineer, who I contacted by phone in 2010 at the University of Missouri to discuss nurse fatigue theory. By December 2010 Dr. Luna and I agreed to formalize our discussions into a plan of research and received approval from Linda Johnson, RN, MSN, Mission Hospital Chief Nursing Officer, to convene a study team and conduct nurse fatigue investigations. Our study team members included graduate nursing research students who were also Mission Hospital nurse managers, Mary Olivas, RN, MSN, Gerri Mazza, RN, MSN and staff nurse Anne Faust, RN, MSN. Mission Hospital Clinical Director, Connie Gagliardo, RN, MN, doctoral nursing student Teri Arruda, NP and University of Missouri Human Engineer, Dr. Linsey Barker Steege also joined the study team and participated in monthly study meetings by conference call and attending annual meetings. By the first year, we completed our survey design including items and concepts that were important to our theory. 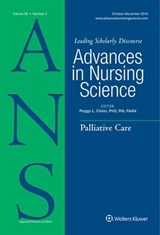 During a monthly study team meeting, we reviewed a compelling paper about the unspeakable in nursing, published in ANS, my favorite nursing journal, written by Dr. Jane Georges, a professor at University of San Diego School of Nursing where our team member Teri Arruda was a doctoral student. One Saturday in December 2011 Dr. Luna and I met for lunch near San Diego with Dr. Georges to ask her opinion about publication of our work. Dr. Georges assured us the work was worthy to consider for ANS publication and her contributions were essential to the success of this publication. Dr. Georges also contributed to the evolution of the model during our discussions about the physics of nurse force and the importance of studying and preventing hospital nurse fatigue and patient harm. The current evolution of the Hospital Nurse Force Theory was considerably advanced when we realized the study domains of hospital, nurse, fatigue and harm were inadequate to describe and measure the essential and dynamic force and belief that hospitals exist for nursing care and essential nursing practice requires the recognition and prevention of patient harm. 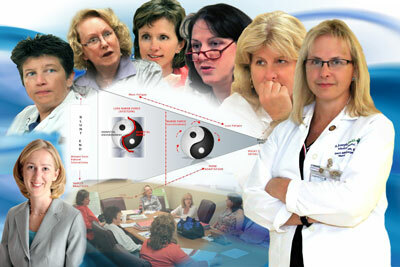 Optimal hospital nurse force is the combination of nurse wellness, professionalism and education in sync (yin-yang) with the hospital environment and resources. Our theoretical discussions have guided our research strategy to apply empirical methods over three phases of research: 1) design and administration of a survey to test the prevalence of hospital nurse fatigue and test the effect of interrelated hospital and nurse variables on nurse fatigue and patient harm, 2) validate self-report measures with clinical tests of physical, mental, and emotional fatigue and wellness, and 3) design and test interventions to mitigate or prevent hospital nurse fatigue and patient harm. In February 2012, 420 Mission Hospital RNs completing a 100-item online nurse force and fatigue survey. Summary of the findings is underway as well as a publication to validate survey domains in cooperation with Dr. Mary Wickman, nurse researcher at St. Jude Hospital in Fullerton, CA a sister hospital of Mission. Mary Olivas, RN, MSN and I presented the Hospital Nurse Force and Fatigue (HNF&F) theory at the International Sigma Theta Tau Research conference in Brisbane, Australia in July 2012. Connie Gagliardo RN, MSN and I presented the theory to the Nebraska Nursing Association in Lincoln, NE in September 2012 and had the pleasure to meet with Dr. Ann E. Rogers, the keynote speaker whose research has been inspirational to our research. lower left to right, Dr Linsey Barker Steege, Gerri Mazza, RN, MSN, Dr Michele Luna, Dr Diane Drake, Mary Olivas, RN,MSN, Connie Gagliardo, RN, MN and Anne Faust, RN, MSN. dissertation. Shanghayegh Parhizi a doctoral student of Dr. Barker Steege has joined the study team to use the survey data for dissertation source. Dr. Barker Steege and her colleague at the University of Missouri, Dr. Kalyan Pasupathy have joined me to conduct data mining on fatigue and wellness in night shift nurses, preliminary work to evaluate breast cancer risk and screening practice of night nurses. The study team continues to meet monthly with plans to design and test interventions to promote hospital nurse force, test methods to mitigate nurse fatigue and prevent patient harm. We welcome your comments and questions by email at diane.drake@stjoe.org. This story, I hope, will be an inspiration to others who have an idea you want to pursue with a team of colleagues! Visit the ANS web site today, and download your copy of this inspiring article! ← NEW! ANS for the iPad! Nurse fatigue and patient safety continue to be priority topics for discussion for higher education curriculum. Many of our Leadership & Management undergraduate students (seniors) at Belmont University choose 12 hour versus 8 hour work shifts as their “Change Project” topic. The majority of the senior nursing students are in the 25-30 age range, and they are reporting medication administration errors, workarounds for poor processes, and the negative effects of fatigue and maintaining patient safety, in their clinical training. Interesting work from my SoCal colleagues, miss you. 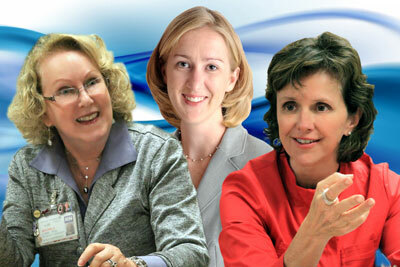 I just posted this blog entry link and journal article to the ANA Professional Issues panel on Nurse Fatigue. Please let me know if I violated any copyright infringements. As noted in this article this is an important topic as noted by the fatigue panel’s formation.